I grew up under the spell of The Bluebird. 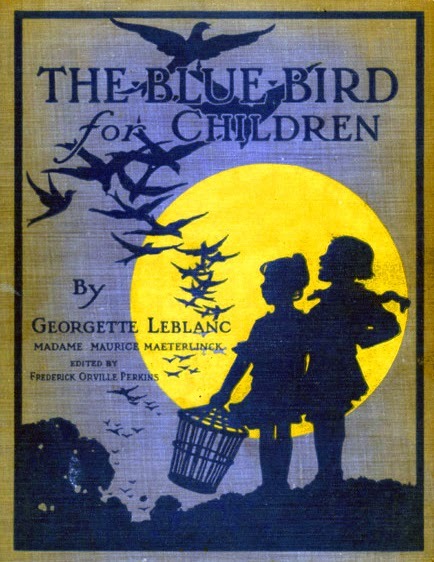 The children's version of Belgian symbolist poet and playwright Maurice Maeterlinck's 1908 play is of my mother's cherished childhood books, and she read it to me often when I was small. In the book, the children Myltil and Tyltil travel to the Land of Memory, the Palace of Night, and even to the Kingdom of the Future, in search of the elusive bluebird of happiness. That's the cover of my mother's book, above. Myltil and Tyltil, cage in hand, set out to find the bluebird, guided by the personification of Light and aided by a magic diamond that enables the wearer to see the true nature of all they behold. 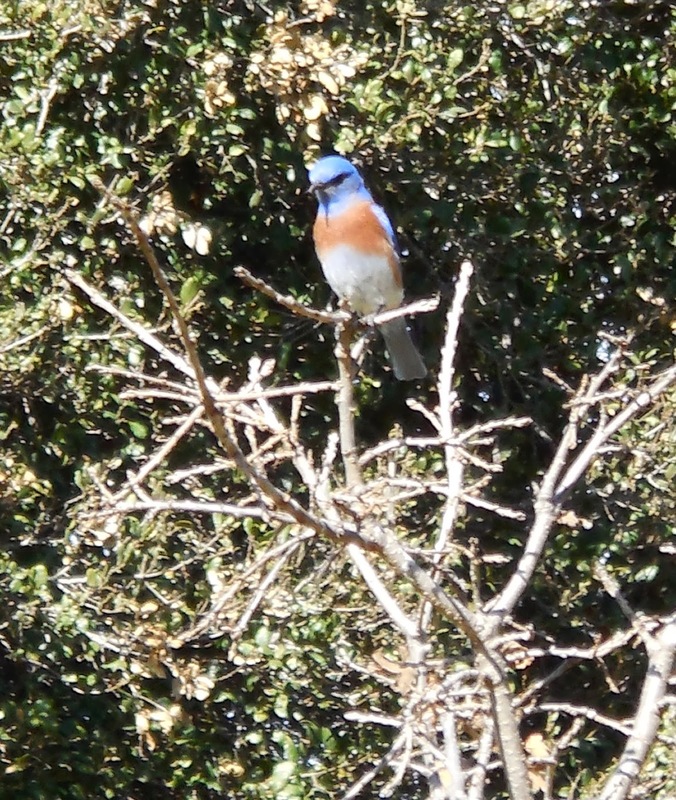 My thoughts strayed to The Bluebird as I set out last weekend to count birds for the Great Backyard Bird Count. The count is an exercise in citizen science, the play is a symbolist allegory, but Maeterlinck might have argued that everything is an allegory, and that both philosophies seek to uncover what is perceived as the true nature of the world, so perhaps it isn't strange for the two things to overlap. 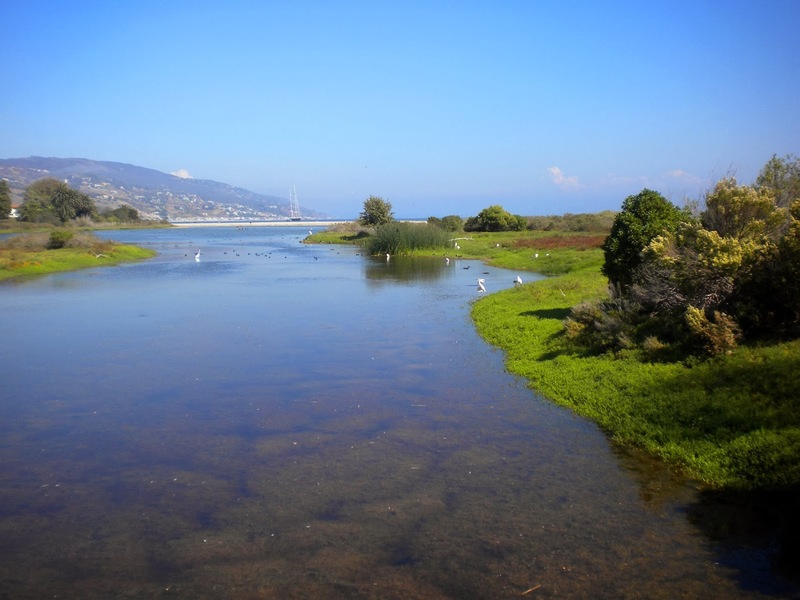 In the Land of Memory, the Malibu Lagoon is lush and green. In the Kingdom of Tomorrow it may look like this again, at the moment, between construction and the drought it's a bit threadbare, although it was still a promising place to count birds, I hoped. When I arrived, I found my thoughts straying from Maeterlinck to Lewis Carroll: "No birds were flying overhead, there were no birds to fly." However, there was evidence of other visitors. A raccoon was here. In fact, an entire flock of raccoons appeared to have been practicing English country dance by moonlight in the mud. 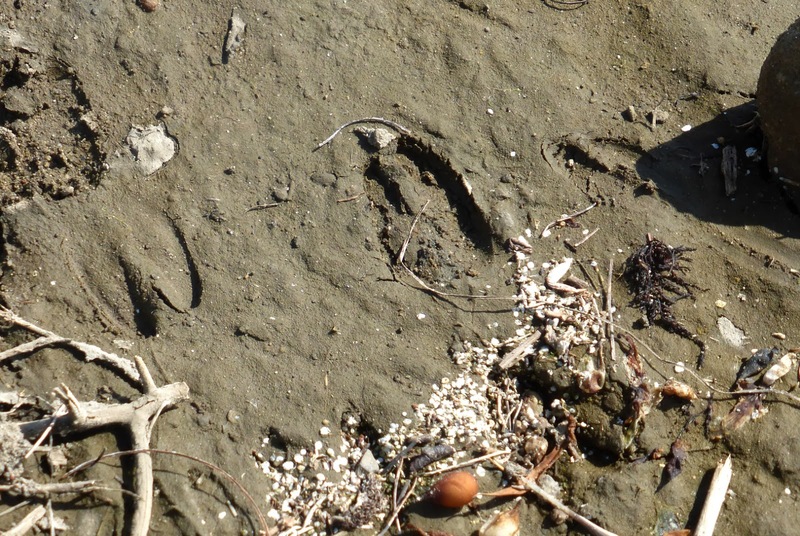 Deer left neat hoof prints in the soft mud, too, as they skirted the edge of the lagoon to graze on State Park's tender new plants. Deer on the beach used to be a common sight in Malibu. 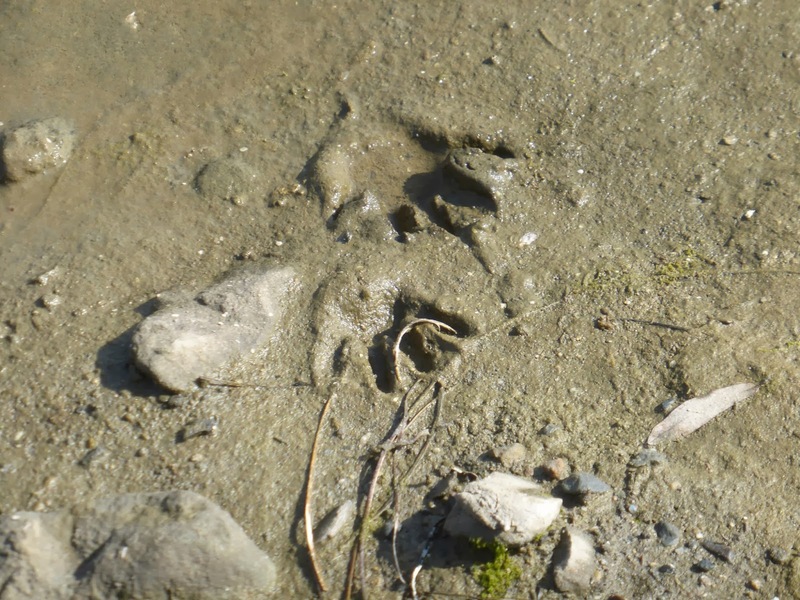 In the 19th century, it wouldn't have been unusual to see a bear shambling along the shore. The bears were gone by the end of the 19th century, and as the houses that form the Great Wall of Malibu sprang up in the 20th century, wildlife access was greatly impeded. 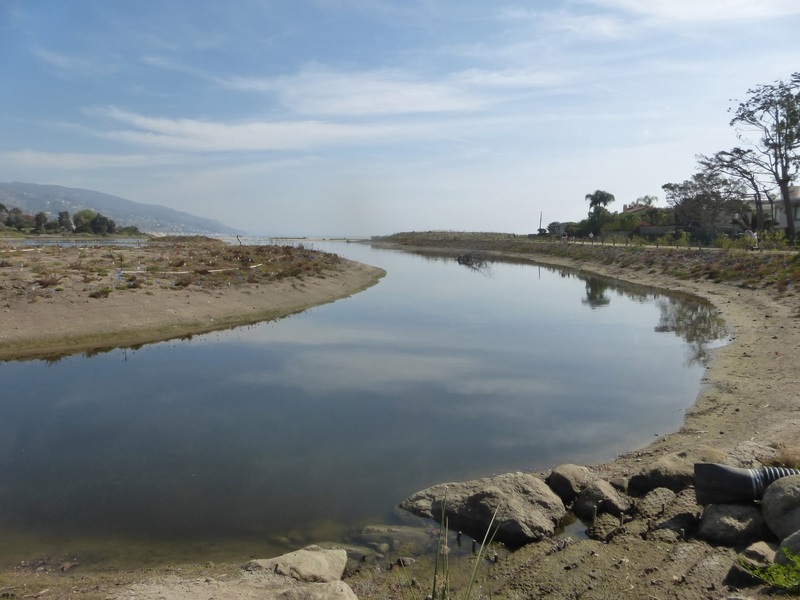 The park, with its direct connection to the Malibu Canyon backcountry, provides an increasingly rare island of oceanside habitat. Birds at last! It turned out to be just a quartet of mallards—three males and a female, but even this most common and ubiquitous duck has its beauty, and is worth a closer look. 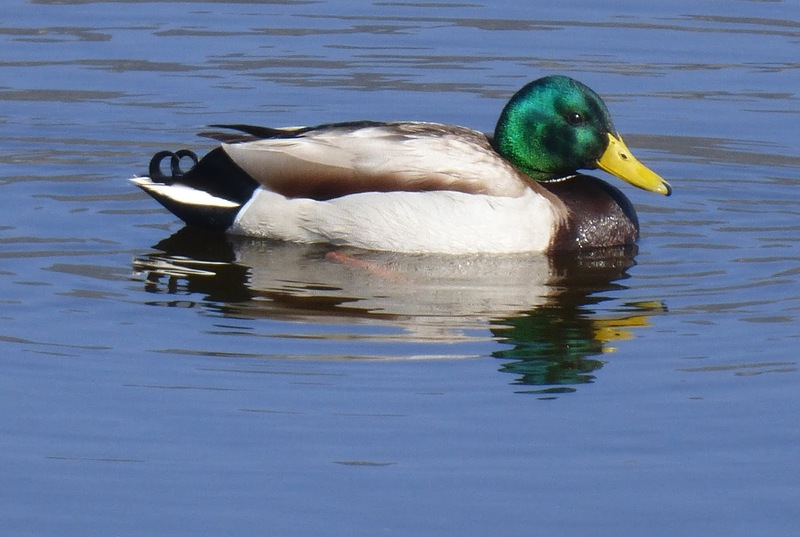 A male mallard, showing off his beautiful bottle-green head feathers and his characteristic curly duck-tail. 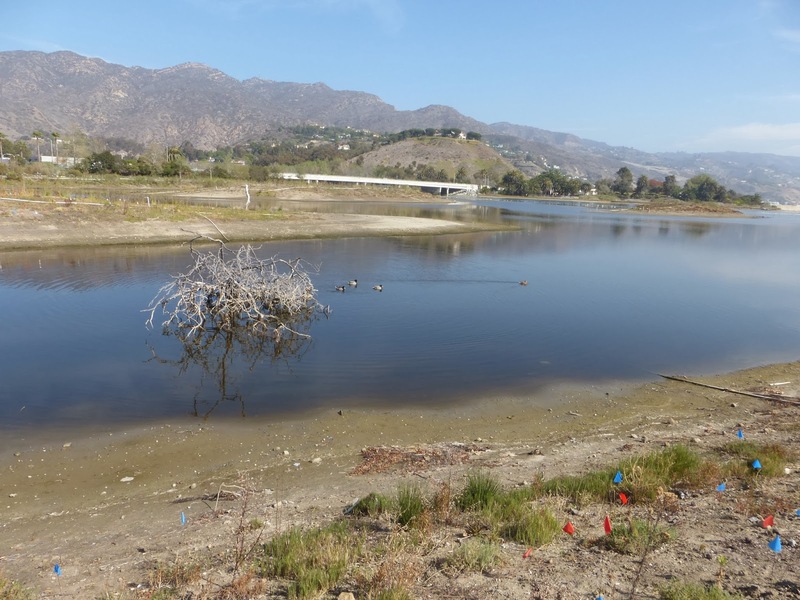 If birds are living dinosaurs, then the main channel of Malibu Creek is a sort of miniature Jurassic Park. 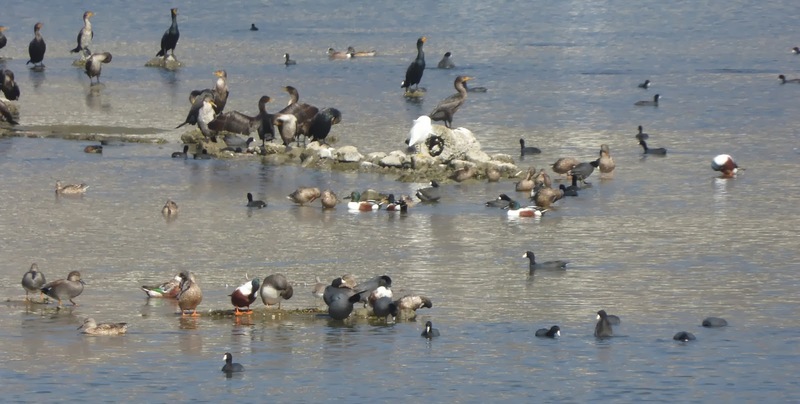 This photo includes double-crested cormorants, an armada of American coots, northern shovelers, gadwalls, teals, an assortment of unidentifiable female ducks, and a lone snowy egret, all coexisting peacefully. 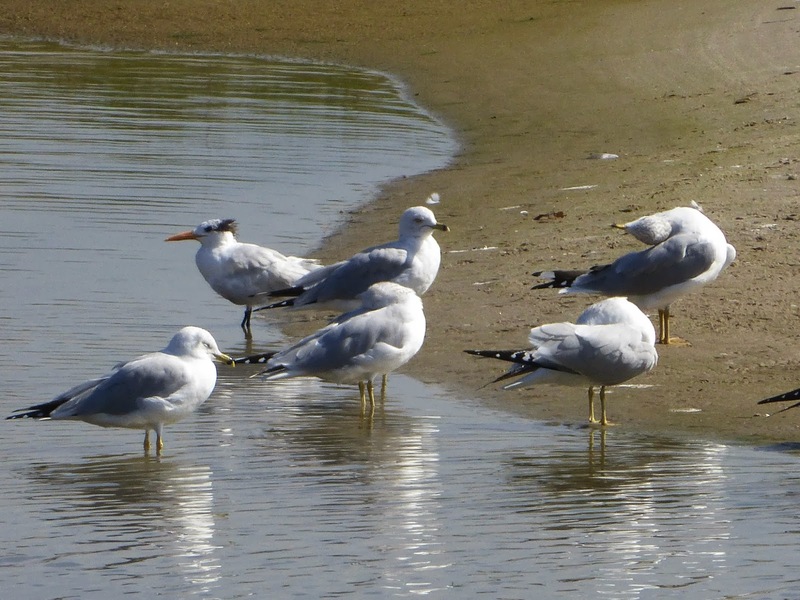 A rather disheveled royal tern joins a party of ring-billed gulls by the edge of the sand berm. 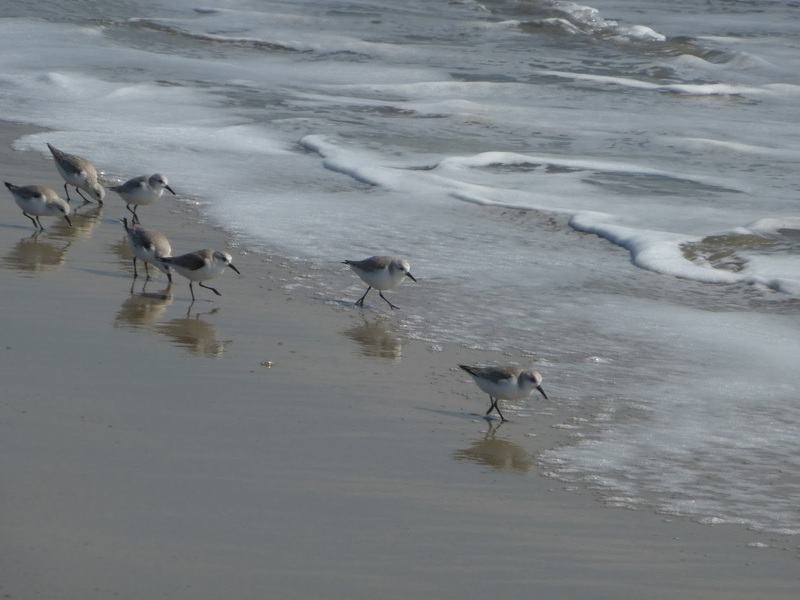 All along Surfrider beach the sanderlings were out, racing the tide to feast on sand crabs. 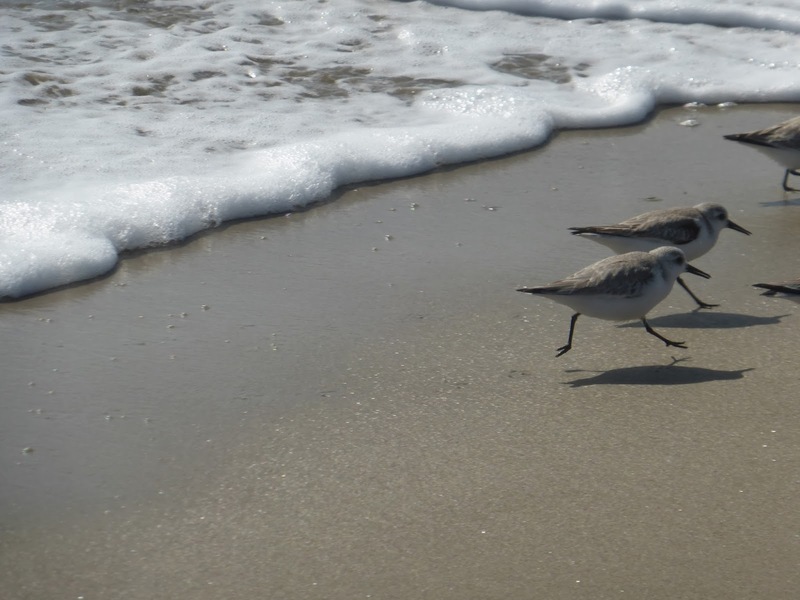 This is a more realistic photo of the sanderlings, sprinting out of the camera's viewfinder. 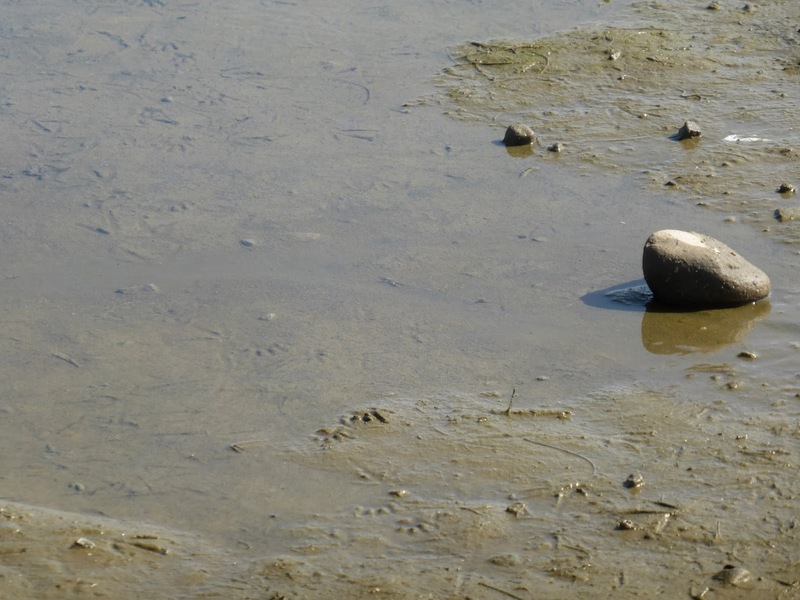 All of the peeps—that really is the official name for the small sandpipers, even if it makes one think at once of neon Easter marshmallow chicks—are speedy, but the semipalmated plover is a little less zippy—and easier to photograph—than its smaller cousins. 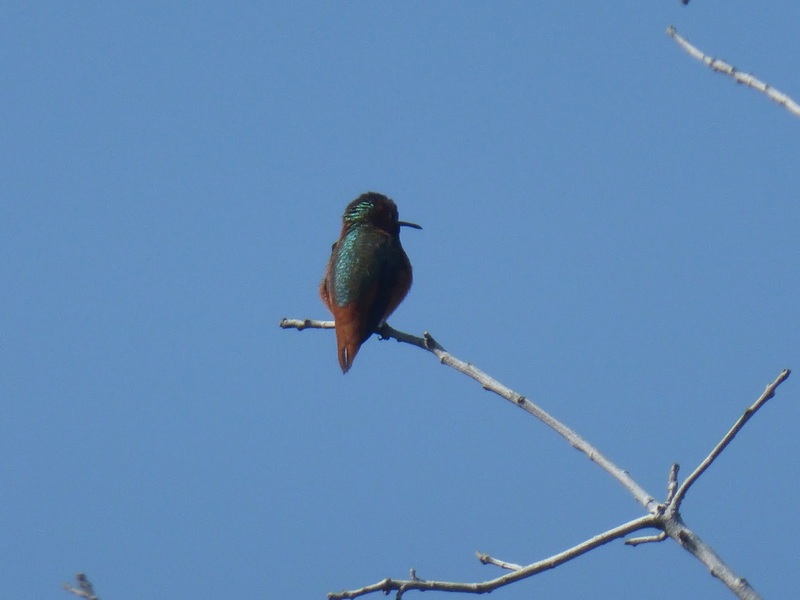 On my way home, I did finally see a bird in the reconstructed portion of the park: one rufeous hummingbird, perched on a bare sycamore branch, singing a shrill, sweet song. I counted 17 species of bird in the space of about an hour. This western snowy plover didn't make the list, it was hiding out in a group of sanderlings and I didn't see it until I took a look at my photos. 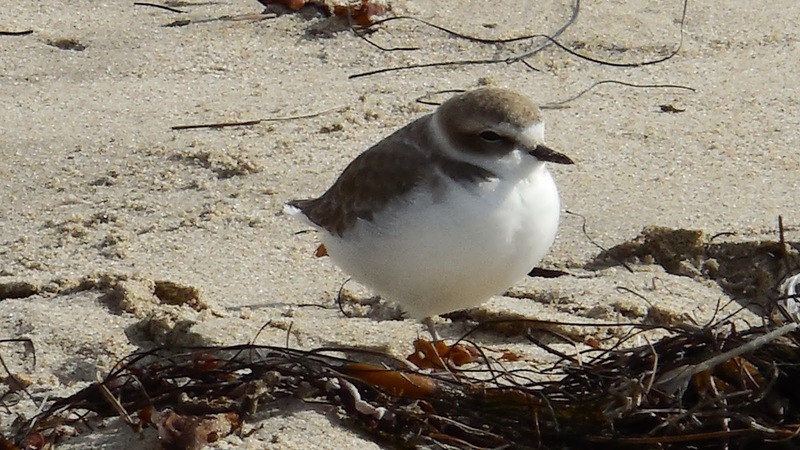 The snowy plover is a good poster child for the Great Backyard Bird Count. 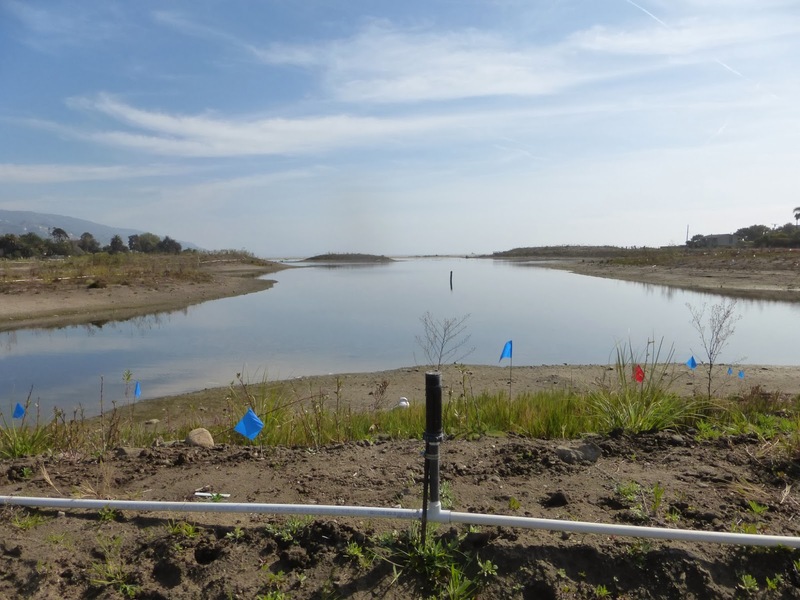 This species may be facing extinction in California due to habitat loss. Its plight has brought conservationists together to fight for its continued survival. Each bird represents hope for the future. 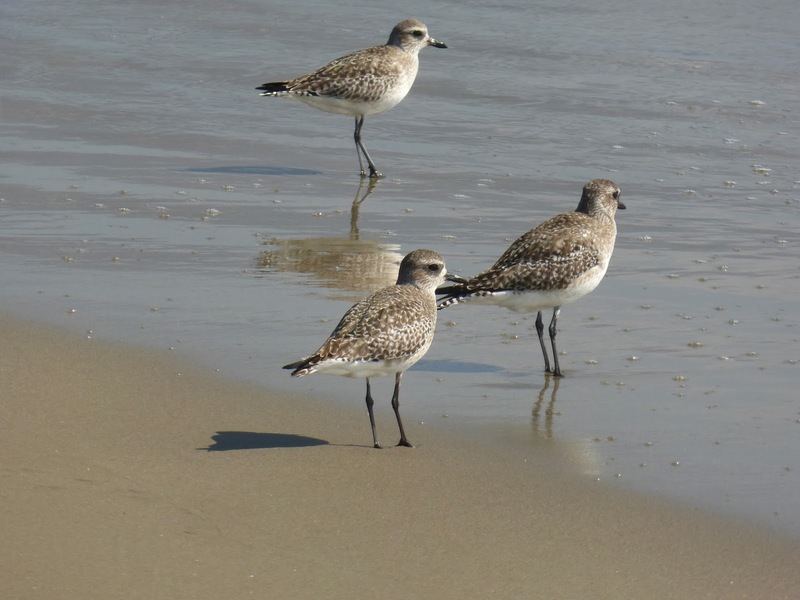 The GBBC takes place once annually, but birdwatchers can report their observations all year long at ebird.org. And the Bluebird of Happiness? It was at home all the time I searched for it. Isn't that always the message of the story? 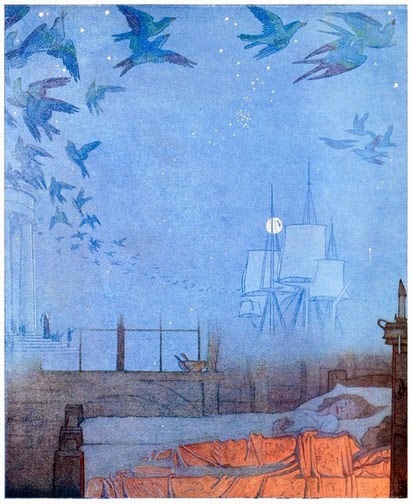 An illustration by Frederick Cayley Robinson, from a 1909 edition of Maeterlinck's Bluebird.